Desem bread (DAY zum) is a unique whole wheat sourdough bread from Finland that tastes just amazing! There’s nothing tricky about making the bread itself. 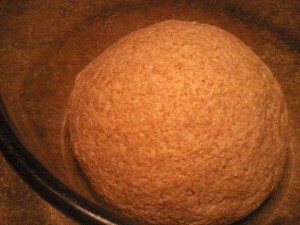 In fact, once I have the starter going, I can make bread in literally 5 minutes a batch because it’s so simple. The starter takes a bit more to make. It’s not hard or anything, and it doesn’t take a lot of your time, but it does require about two weeks to fully develop. Once you’ve got the starter, you just feed it each time you bake and save some to use in your next loaf. So you only make the starter once. In this recipe, I’m going to show you how to make the starter from scratch and bake the first loaf of Desem step by step. At least 10 pounds (30 cups) hard red wheat, freshly ground into coarse flour. 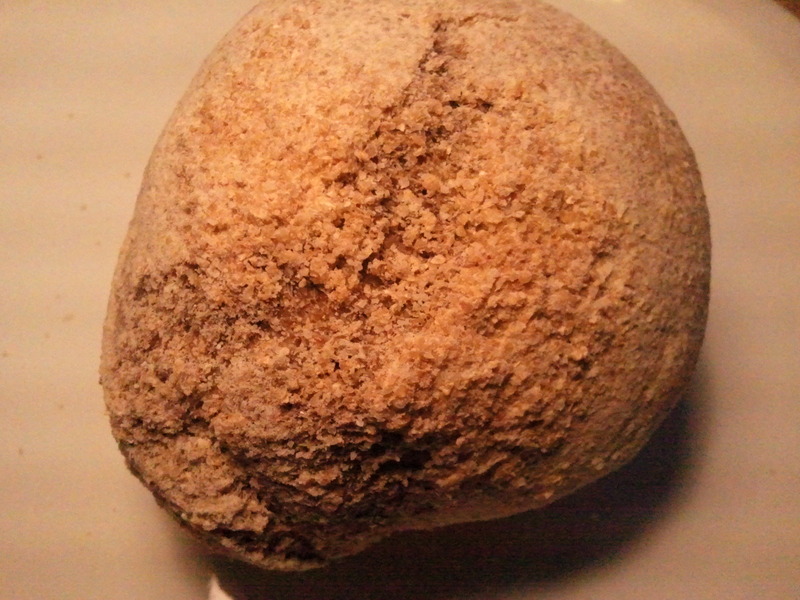 You could use fine flour, and you could use a white wheat, but we think coarsely ground red wheat is best. And it MUST be freshly ground. You’ll be burying (Yes, you read that right. Burying.) 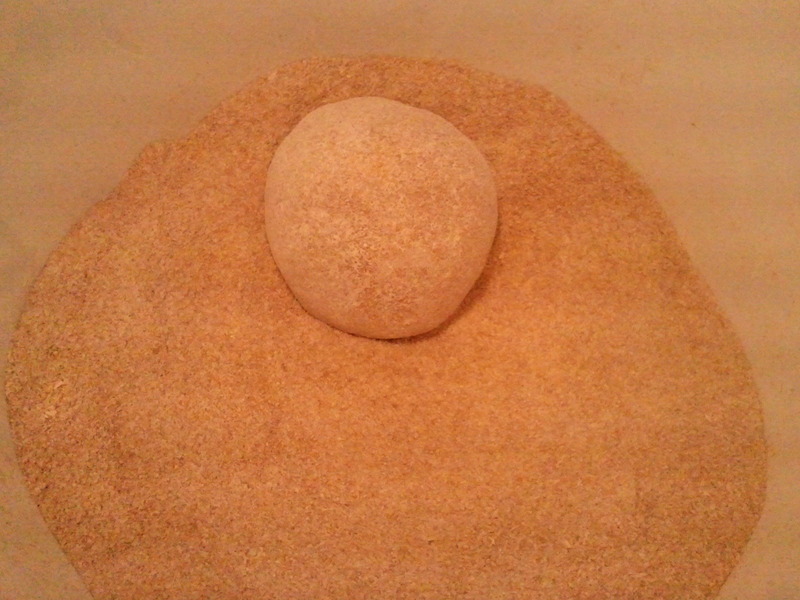 the desem in flour, and you’ll need at least 2 – 3 inches of flour on all sides of the starter. About 1 cup cool, unchlorinated water. A big container, like a 5 gallon pail, large paper bag, kettle, or a very large bowl. A place to keep the starter cool (ideally 65 – 70 degrees, but not over 72) for 5 – 7 days. We’re using our attached garage in the late fall. 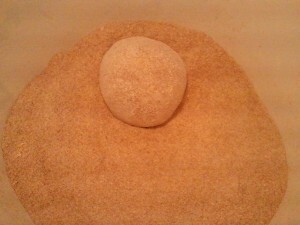 Mix 2 cups of the flour with about a cup of cool water and knead it together. After about 2 minutes of kneading, it will look like this. You may need to add more flour or water as you go. The idea is to end up with a stiff dough, though, not anything too soft. And after about 5 minutes of serious kneading, it’s about ready. I’ve pulled it apart here so you can see the inside. It’s somewhat elastic now, although it’s hard to tell in the picture. Form the whole thing into a ball the best you can. And then bury it deep in a bucket/bag/bowl/pot of flour. I’m using a 5 gallon pail here, more than halfway full. Now you’ll need a place to keep it for 48 hours where the temperature will stay between 50 and 65 degrees. I think 60 is about the ideal, but whatever you do, don’t let it get above 70. You may need to move it from place to place to get it right. When the weather is just right, I will often put mine outside during the day and bring it in at night. For the last 48 hours, my starter has been on the porch, in the garage, and in the house; I had to move it a few times to keep a steady cool temperature. During that time, it’s expanded so much that it cracked open. 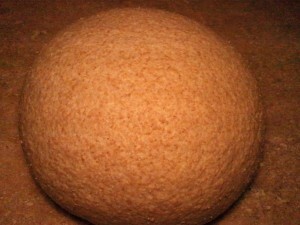 This is really good and shows that the sourdough process is working. 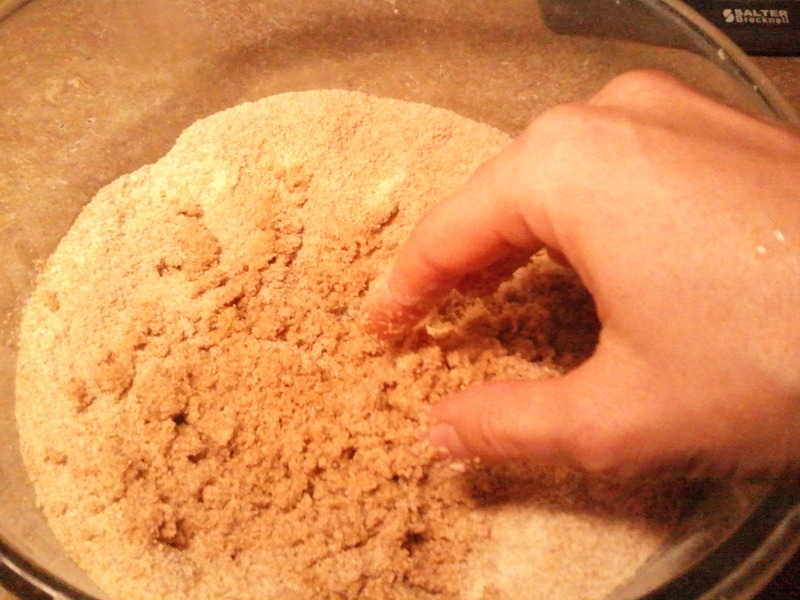 Then make a mixture of 1 cup of flour (It’s okay to use the same flour the dough was buried in.) and 1/2 cup of water. Combine this mixture with the soft dough ball and knead for about 5 minutes. Bury it in the pail of flour for another 24 hours at 50 – 65 degrees. Repeat what you did on day 3. Today, instead of cutting the crust off the desem starter, combine the whole thing with 1 cup flour and 1/2 cup water. Knead it until it’s well combined and smooth. 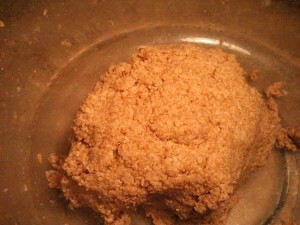 It will be a little crusty at first but will soften as you continue kneading. Now, instead of burying the dough in the pail of flour, place it in a glass or ceramic bowl (a pottery crock with a lid is ideal) and cover it with plastic wrap or some other lid that is not air tight. Return it to its cool place for 24 hours. You can put your flour in the fridge now or keep it in the same cool place as before. It will take a while, but you’ll eventually use it all in the desem bread. It works best if you start this step in the late morning. This step gets us ready to bake the very first loaf tomorrow, so don’t worry about it too much if it hasn’t been a full 24 hours since your last feeding. 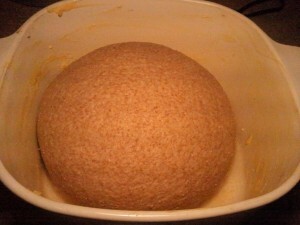 Feed your starter just the same as yesterday: mix 1 cup flour and 1/2 cup water and knead it together with the starter. Cut it in quarters. One of these quarters is the starter you’ll keep for future baking. The other three pieces are the beginning of your first loaf of bread. 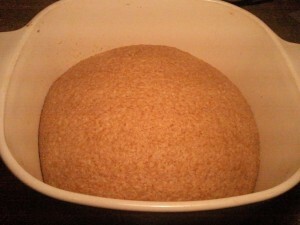 After you’ve fed your starter, begin the bread by dissolving 2 1/2 teaspoons of natural salt in 1 1/2 cups of cool water. Then mix in 3 cups of your coarse flour. (Again, it’s okay to take this from the pail of flour you ground on day 1.) Leave this flour mixture out at room temperature for about 8 – 10 hours. 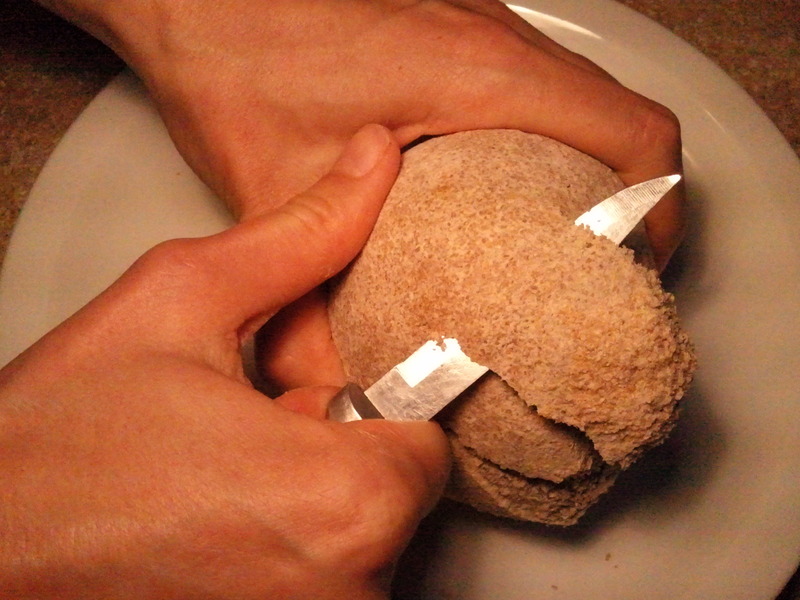 Put your starter in a bowl also (all 4 quarters of it), cover the bowl, and store it in a place that is 65 to 70 degrees for 8 – 10 hours. Since this is the first loaf of desem bread, the dough is going to rise for a pretty long time; 8 – 10 hours. It’s nice to start this step before you go to bed so you’ll have time for another short rise in the morning and then the baking. All you need to do now is combine 3 quarters of your starter (Put the other one back in its bowl and store it at 65 degrees for 8 – 10 hours. 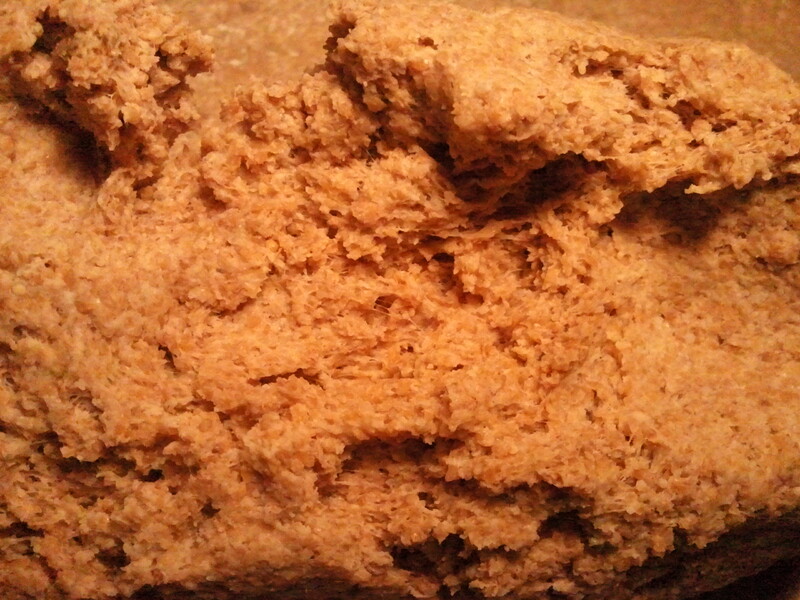 This is the starter that will leaven future loaves.) with the flour you mixed up this morning. Knead it thoroughly. You should be able to feel when the flour mixture has combined well with the starter. It should be a fairly stiff dough. 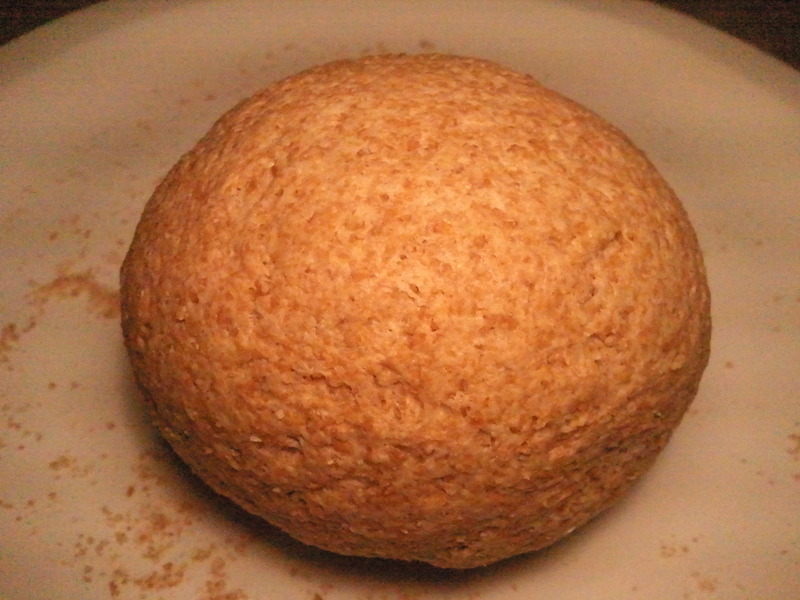 Continue kneading the dough for about 2 minutes after you feel that it’s no longer crumbly. In the video, I kneaded for about 3 minutes altogether, but you may need more time if you’re not very experienced. Once the dough is well kneaded, round it by sliding the dough along your kitchen counter, stretching the surface of the dough as you pull. This forms it into a nice, tight ball. 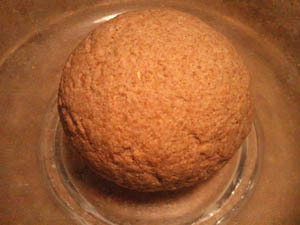 Then place the dough into a bowl, cover it loosely with plastic wrap or a dinner plate, and leave it to rise at 65 – 70 degrees (cool room temperature) for about 8 – 10 hours. It won’t rise much this first time, but you should notice a difference in the size. Generously butter a 3 or 4 quart casserole dish and sprinkle the bottom with cornmeal. 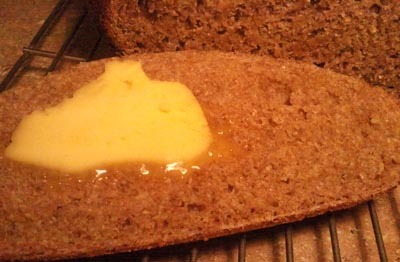 Although your bread probably won’t rise very much this first time, butter the casserole lid also. 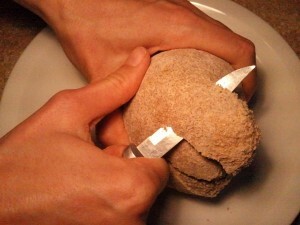 Then place the rounded ball of dough inside. It’s important that the dough rise in a humid environment, so sprinkle the lid and the top of the dough with a little water. Then turn off your oven, close the casserole lid, and put the bread in the oven to rise for 2 – 3 hours. 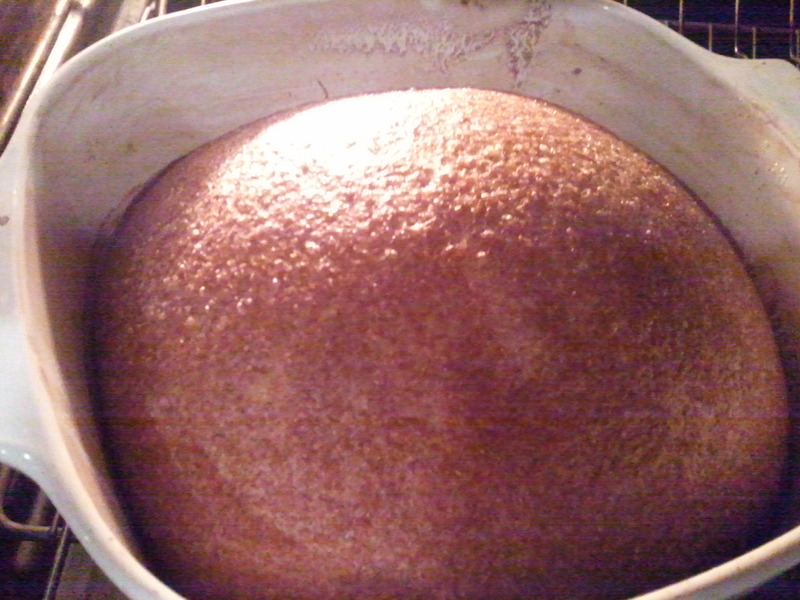 It won’t rise much, but it will soften and sag a little. Here’s what mine looked like before I baked it. Now it’s time to bake! Take the dough out of the oven so you can preheat it. I generally set my dough on the range so that it still gets some heat from inside the oven. Preheat your oven to 400 degrees. You’ll bake your bread at 400 degrees for about 30 minutes or until the crust is rosy brown, then turn the oven down to 350 for another half hour or so. It’s a little tricky to tell when this bread is done. 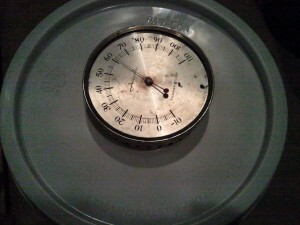 This timing usually works well for me as long as I use the same baking dish. You may need to experiment until you figure out the right length of time. For the next several days, you’ll need to feed your starter daily with 1 cup flour and 1/2 cup water. 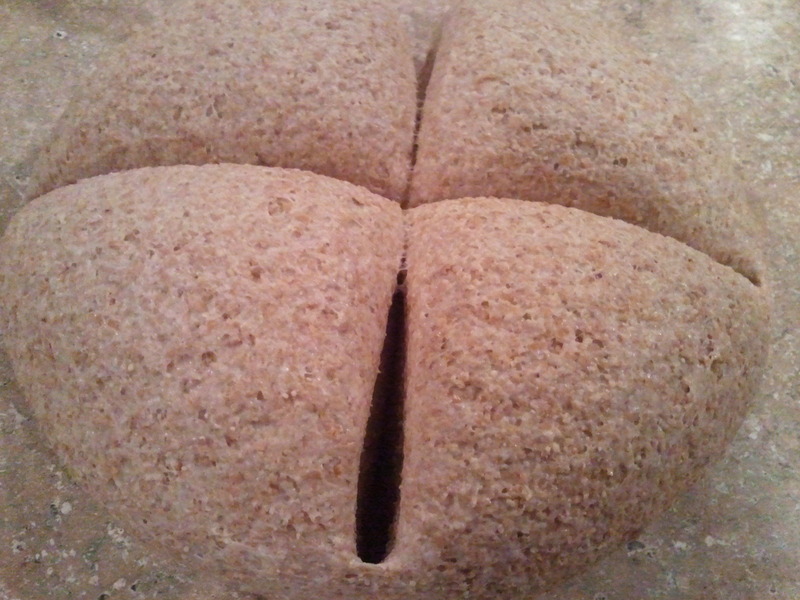 If you want to, you can actually make several loaves this week by following the same instructions you used on day 7. Then, on day 14, the desem starter will be mature, and we’ll start making desem bread the way you’ll make it for years to come.